For this, clustered beans, banana flower, banana stem, onion, beans, thattaippayiRu, vendayakkIrai, radish kIrai, beetroot kIrai and muLaikkIrai are good. If banana flower is used, remove the stem, chop and remove the astringent taste by pressure cooking it with a little diluted tamarind water, turmeric powder and salt. If you use banana stem, cut it finely into small pieces and remove the fibre. The other vegetables are also to be cut finely into small dices. If you want the paruppu usili hotter, you may add 1 or 2 red chillies. When you add salt to this, remember to adjust it when you also add it to the vegetables to avoid excess salt. Cook the cut vegetable pieces (250 gms) and pressure cook them except onion and kIrai which are just cooked directly. Keep aside. Soak all the dAls mentioned above in water for half an hour after cleaning. Strain and add to them chillies, asafetida and salt. Grind them coarsely without adding water as we prepare for vaDai. If need be a very little water can be added. Take out and add turmeric powder and ½ tsp refined oil to the coarse mixture. Mix well and steam it over a greased plate for 5 to 7 minutes. After it cools, grind with only one revolution in mixie for just half a second and keep aside. Now take the remaining oil in a kaDAi and season mustard and curry leaves (if you make paruppu usili from KIrai, you need not use curry leaves). Add the cooked vegetables with a little salt and sauté till the water is removed. 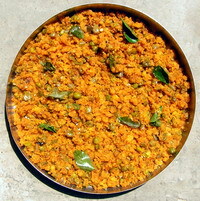 Add the ground paruppu usili and turn for 2 minutes and remove from the fire. Cut the bitter gourd (250 gms) into thin slices (circular or half circle) and dry them under fan. After they dried, take 1½ ladleful of refined oil in a kaDAi and fry (roast) it crisp under simmered flame, taking a little quantity only at a time instead of frying the whole. As soon as they are roasted in oil completely, again place the roasted slices in oil with salt to taste and red chilli powder. Mix well. This curry, rather chips would be nice for rasams or sambAr & vatral kuzhambu rice. We can even just add it to raw cooked rice and mix well and eat. We can eat it as chips also. 1. Bread crumbs: The other day a woman told to me that though she was searching for bread crumbs in the bakery and grocery shop she could not get. I advised her that they could be prepared at home. You can also prepare bread crumbs at home instead of running for them. You can use either the crusts of bread slices or the slices in whole by drying them in the sun or in the oven and grinding them into coarse powder (like samolina or sUji) after cooling. Refrigerate for use in emergencies. 2. In order to avoid the resin oozing out from plantain flower, raw and ripe jack fruit etc., sticking to your palm or fingers while cutting them, first some cooking oil, preferably coconut oil, and then start cutting. The stains from beet root, plantain, brinjal etc will vanish if you wash by detergent soap. Itching caused by Yam, colocasia etc can be stopped by applying a little tamarind juice and washing after 5 minutes. While cutting plantain stem, you encounter much fibre. This can be removed by putting the pieces in water while cutting and moving around them a twig of coconut broom or any other rough surfaced twig. Unless they are tender, you need to remove the fibre from both sides of all types of beans. This entry was posted on March 29, 2011 at 8:30 pm and is filed under Curry Varieties with tags asafoetida, banana flower, banana stem, beans, beet root, Bengal gram dal, bread crumb, brinjal, clustered beans, colocasia, curry, curry leaves, detergent soap, fibre, green chilli, jack fruit, kadai, keerai, mustard, onion, paruppu usili, plantain, rasam, red chilli, red chilli powder, refined oil, salt, sambar, samolina, saute, sooji, split gram dal, turmeric powder, vatral kuzhambu, vegetables, yam. You can follow any responses to this entry through the RSS 2.0 feed. Both comments and pings are currently closed.